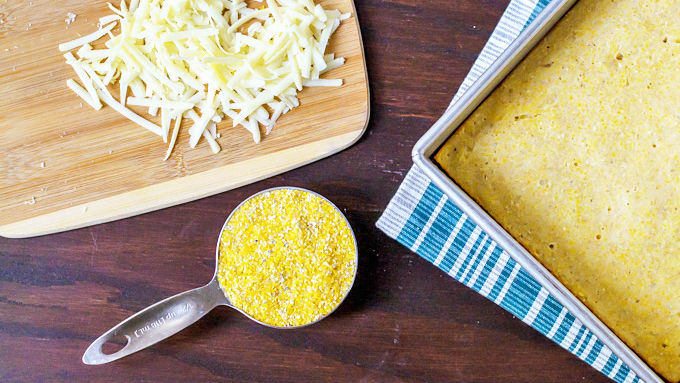 Prepare the corn bread: Place a rack in the center of your oven and preheat the oven to 425°F. Lightly coat an 8x8-inch dish with cooking spray. In a large mixing bowl, combine the cornmeal, all purpose flour, whole-wheat flour, baking powder, and salt. In a separate bowl or large measuring cup, combine the milk, canola oil, and egg. Make a well in the center of the flour mixture, pour in the liquid ingredients, and then stir just until moist (the batter may be lumpy, but do not over mix). Fold in the cheddar cheese. Spoon the batter into the prepared dish and bake for 16 minutes, or until a wooden pick inserted in center comes out clean. Cool 5 minutes in pan on a wire rack. Remove from pan to cool completely. Reduce oven temperature to 350°F. Prepare the stuffing ingredients: Heat the oil in a large skillet over medium, then add sausage and sauté for 2 minutes, breaking it into crumbles. Add the jalapeño, bell peppers, onions, garlic, salt and black pepper. Sauté 3 minutes, until just beginning to soften. Remove from heat, then transfer to a large mixing bowl. Cube the cornbread, then crumble the cubes into the bowl with the sausage. In a small bowl, combine the chicken broth, egg, and 1 tablespoon Sriracha. Pour over the cornbread mixture and gently stir to combine all of the ingredients. Lightly coat a 9x13-inch glass or ceramic pan with cooking spray, then add the stuffing to the dish. Bake at 350°F for 45 to 55 minutes, until the top is crisp and golden and the liquid has set. To serve: Drizzle with Sriracha as desired, then sprinkle with cilantro. This stuffing has plenty of kick and tons of flavor; it's almost too good to be considered a side. Move over, boring sides—there’s a hot new dish in the family! Easy Chicken Sausage Stuffing with Sriracha has arrived and is ready to heat up the dinner table. Too often, stuffing tastes like little beyond mushy bread cubes. That kind of tasteless offense wastes valuable plate real estate and should not be tolerated. 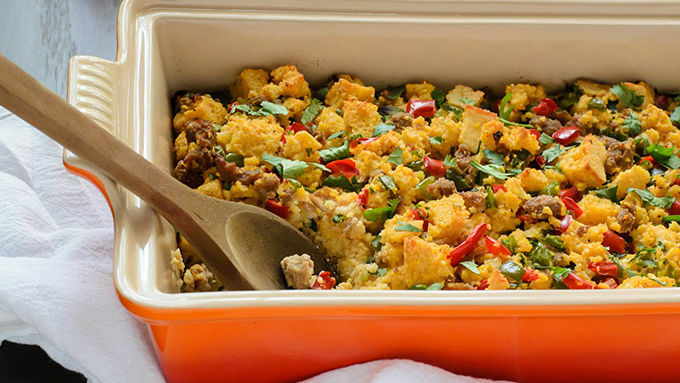 This spicy stuffing, however, is anything but mundane! 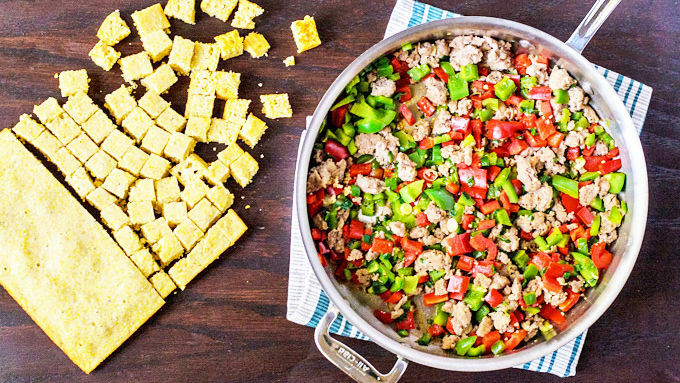 With three kinds of peppers, cheesy homemade cornbread, and zippy chicken sausage, this side is ready to rock your holiday menu. Homemade cornbread is one of the secrets to this stuffing’s rich flavor. I used my all-time favorite, ultra-easy cornbread recipe — it’s one bowl, whole wheat, and loaded with sharp white cheddar cheese. You could use a mix instead, but this recipe is so easy and tasty, it’s worth it. Next, come the mix-ins — this is where so many other cornbread recipes fail and this stuffing excels. Stuffing shouldn’t just be bread. It should be bread and lots of other really good STUFF! Ours begins with red and green bell peppers, fiery jalapenos, and bright green onions. 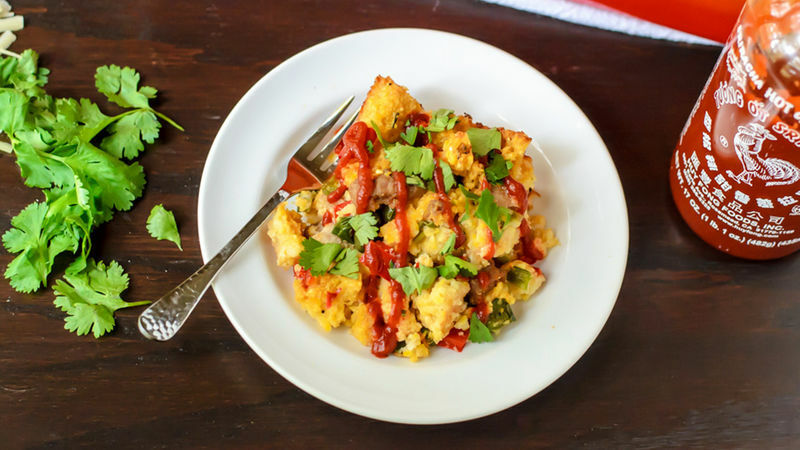 Although this Easy Chicken Sausage Stuffing with Sriracha might technically belong in the “side dish” category, if I were the turkey I’d be nervous. This zesty dish is poised to steal the dinner spotlight!